The difference is in how transactions are verified. Bitcoin has been creating a lot of buzz lately as more and more people invest in the cryptocurrency. But, behind all this success is a blockchain that’s sustained by miners who, as it turns out, actually use massive amounts of electricity for each transaction. Bitcoin are mined using the computing power of hundreds of CPUs all over the world, with each one eating up electricity to continuously verify transactions within the Bitcoin blockchain. Enter BitTorrent inventor Bram Cohen who just started the new company Chia, which he describes in an interview with TechCrunch as “a better bitcoin.” Instead of depending on what’s called a “proof of work” to verify its blockchain, Chia will launch a cryptocurrency that is based on proof of time and storage. This means that Chia will depend on already existing, unused storage space in hard drives. The proof of work model, according to Cohen, is also prone to instability, because the few bitcoin miners with access to cheap electricity actually end up having an outsized influence. “The idea is to make a better bitcoin, to fix the centralization problems,” Cohen told TechCrunch. 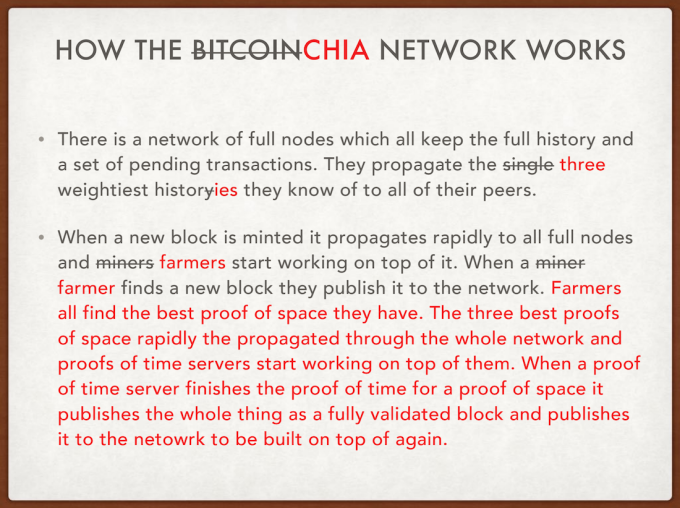 In this sense, Chia becomes an even more decentralized blockchain.